Do you want to see all the highlights of Uganda AND get involved in conservation? During this 14-day trip you will see all the important parks, visit local communities and participate in unique conservation activities. Do you want to see all the highlights of Uganda AND get involved in conservation? During this 14-day trip you will see all the important parks, visit local communities and participate in unique conservation activities. Join researchers for a full-day Chimpanzee Habituation Project in Kibale. You will be able to observe and follow the chimps leaving their overnight nests between 6:00 – 6:30am until it is time to build new nests around 7pm. For people who yearn to get up close with wild African big cats, you can join researchers on a Lion Tracking project in Queen Elizabeth National Park! This is not just an activity created for visitors, it is scientific research that is recorded and gives the researchers a better understanding of the habits of the lions found in Queen Elizabeth Park. This is the ultimate Uganda conservation and safari experience – from the famous Nile to the Rwenzori Mountains. 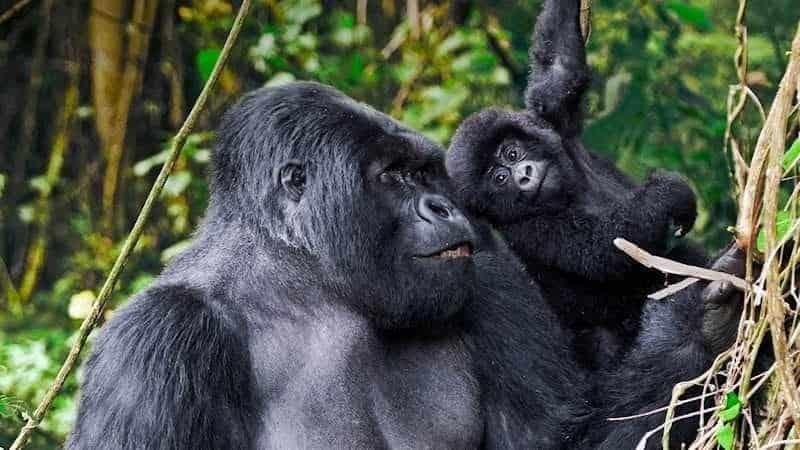 National Parks and protected areas you will visit include Ziwa Rhino Sanctuary, Murchison Falls National Park, Semuliki National Park, Kibale National Park, Rwenzori, Queen Elizabeth National Park, Bwindi Impenetrable National Park, bird paradise Lake Mburo National Park and Mabira Forest. En-route, community initiatives included: Batwa pygmie communities, Bigodi community. Activities game include lion tracking, chimpanzee habituation, game drives in the world’s most beautiful national parks, two boat safaris in different areas, visiting traditional kingdoms, the Sempaya Hot Springs, an exciting night game drive, photographing tree-climbing lions, Mountain gorilla trekking, and optional water rafting for a thrilling experience along the Nile. The start of your 14-days conservation safari. Arrive at Entebbe airport where you will be welcomed by our professional guide who will transfer you to Kampala for a comfortable overnight stay and dinner at the Cassia Lodge Sheraton Hotel or Le Petit Village Hotel. Both hotels have a rustic elegance, which makes them the perfect place to relax in understated luxury. Enjoy a good swim, chill out and enjoy a view of Kampala complete with natural and local sounds from your room or terrace. Meal plan: dinner and breakfast. The adventure begins! Breakfast and an early departure for Murchison Falls National Park in the north of Uganda. The panoramic drive will go north west through the historical, green Luwero triangle and continue through the savannah with the famous Acacia trees and shrubs. We will stop at Ziwa Rhino Sanctuary for rhino tracking and information about the reintroduction project. Ziwa Rhino Sanctuary is home to Uganda’s only rhinos – making this a must for anyone who wants to see Africa’s Big Five. Both the Black Rhinoceros (Diceros bicornis) and the White Rhinoceros (Ceratotherium simum), are endemic to Uganda. However due to war, poaching and habitat loss, by 1982, both species had been wiped out in the country. Tracking the rhino on foot through the savannah is a thrilling experience. After lunch we will proceed to Murchison Falls National Park which is the largest national park in Uganda. Overnight at Nile Safari Lodge. Meal plan: Breakfast-Lunch-Dinner. Depart at dawn and with the help of a ferry, cross to the northern part of Murchison Falls National Park for a captivating game drive through the park that shelters over 400 colorful, exotic and rare bird species and 75 mammal species including 4 of the Big Five mammals (elephant, buffalo, leopard and lion). You may also be able to view other mammal species like the Rothchild’s giraffe, Hartebeest, Waterbuck, Oribi, Bushbuck, Bohor reedbuck and Hyenas. With some luck, you may spot the ever elusive leopard in the park’s savannah grasslands, which were regarded as the ‘great Kew Gardens’ by Winston Churchill in 1907. Return to the Nile Safari Lodge for breakfast after the early game drive and relax as we wait for lunch. After lunch, we will take a boat cruise to the delta. Watch elephants, hippos, buffalos and crocodiles close-up from the safety of our boat as we cruise gently upstream. 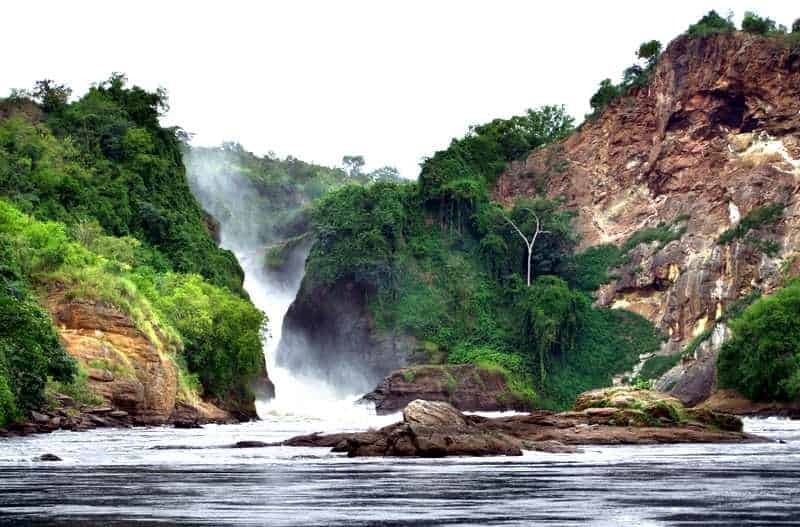 We proceed to Murchison Falls, one of the world’s most powerful waterfalls, where the Nile squeezes through an 8m wide gap before plunging 42m deep into the gorge. This spectacular, scenic view of the falls, with the roaring sound of water creating a beautiful rainbow will enhance your experience of being in the heart of Africa. Return to the lodge in the evening for a delicious dinner and restful sleep with the sounds of the bush. Meal plan: Breakfast-Lunch-Dinner. After breakfast, travel south west through Hoima town where you will stop for lunch and have an experience with the local cultures. Visit Mparo Royal Tombs which is the burial ground for the Bunyoro kings. Bunyoro Kitara Kingdom is one of the oldest Kingdoms in Africa. It is one of the most treasured historical sites in the region. Kabalega’s tomb is inside a round-grass thatched hut with a wooden door. Visitors have to make confessions to the caretakers of the tomb before being permitted to access the site. We will proceed further south west to Semuliki National Park, near the southern shores of Lake Albert. The park is an extension of the Congo biome, with large wetlands and tropical rainforest. Overnight stay at Semuliki Safari Lodge. Meal plan: Breakfast-Lunch-Dinner. Depart at sunrise after breakfast for the famous Sempaya Hot Springs – an hour-long trail to the outer “male” spring leads through a forest where red-tailed monkeys, grey-cheeked mangabeys and black-and-white colobus monkeys are common. A tree house en route provides an aerial view. These hot springs have a geyser shooting up from an eight-meter wide hole. Your guide will show you the female and male hot springs which are differentiated by their degree in temperatures. At the male hot spring, you may be able to carry out experiments like egg boiling in the hot spring or preparation of porridge using the geothermally-heated water of the spring. After your lunch, you may crown your day with a cultural walk to the Batwa pygmy community living adjacent to the park. You can enjoy famous cultural performances including, singing dancing and drama. Relax at the lodge and enjoy a spectacular sunset, while preparing for the night game drive. Driving into the dark is an exhilarating experience holding the possibility of surprise wildlife encounters with animals like big cats, hyenas, the white tailed mongoose and slender mongoose, and many other nocturnal species. Overnight stay at Semuliki Safari Lodge. Meal plan: Breakfast-Lunch-Dinner. Begin the day with breakfast and drive off south east wards through Fort Portal, where you may stop for lunch. Fort Portal town which lies in the shadow of the ‘Mystical Challenge’, the highest non volcanic mountain range in Africa and one of the most challenging hiking spots in the world: Mt Rwenzori. The legendary Ruwenzori massif at more than 5,000m are popularly called the “Mountains of the Moon“. On a clear day you will have a view of the snow caps of Rwenzori – one of the very few opportunities to see snow near the equator. Depending on your interests, we can visit the cultural sites in Fort Portal including King’s palace; the stalagmites & stalactites (locally called “Amabere ga nyina Mwiru” or the breasts of Nyinamwiru), the beautiful crater lakes dotting this region and/or the tea gardens. Proceed south wards to Kibale National park. Overnight stay at Primate Lodge. Meal plan: Breakfast-Lunch-Dinner. After an early breakfast, converge at Kanyanchu Tourist Centre for a briefing before you set out to track man’s closest relative and evolutionary cousin, the chimpanzee, in the forest known as the ‘Primate Capital of the World’. 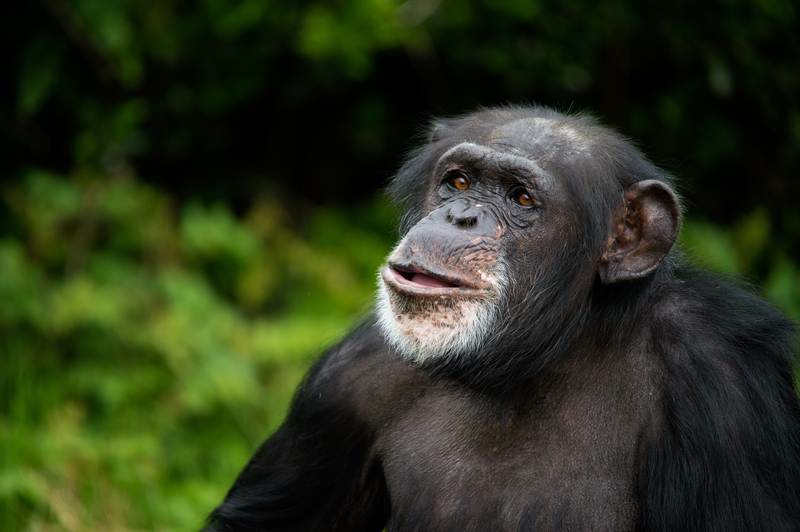 You will participate in a Chimpanzee Habituation project, a unique opportunity. The chimpanzees will welcome you in their world with vocalisations and playful behavior. 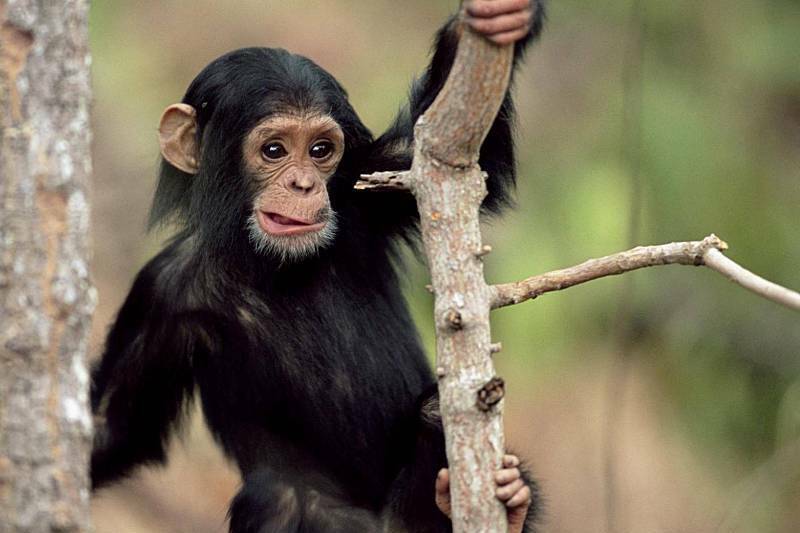 Chimpanzees are closer to humans than to any other animal, an exceptional and memorable encounter. You observe the chimps as they play and feed themselves, undisturbed by the presence of humans. You may also get a chance to see some forest elephants and antelopes, if we are lucky, as well as viewing some of the other 12 primate species that have given Kibale National Park the brand of the ‘Primate Capital’. You will certainly enjoy the botanical richness of this forest with many special plant and tree species, including the mystical ‘Adam and Eve’ tree. In the afternoon, you can take a village walk in Bigodi community including nature walk in Bigodi swamp where your chances of seeing other smaller primates are high. You are likely to see Black and white Colobus, Blue monkey, Grey-cheeked Mangabey, Red tailed monkey, Bush babies and Pottos which sometimes cross over from the park. Return for the overnight stay in Primate Lodge. Meal plan: Breakfast-Lunch-Dinner. While in Kibale we shall wake up very early in the morning, take a breakfast and drive off to the south for Queen Elizabeth National Park via Kasese town where you may stop for lunch. In this town you will have one last view of the fascinating Rwenzori Mountains. After lunch, we will continue and drive further south, to stop at the Equator for some water experiments and photographs. We will proceed to Queen Elizabeth National Park. It will be a scenic drive. You will encounter several savanna mammals including buffaloes, elephants, and various antelope species. Overnight stay at the Bush Lodge. Meal plan: Breakfast-Lunch-Dinner. Take a game drive at sunrise to view the wildlife of East Africa’s most diverse National Park with over 600 bird species and about 100 species of mammals. You are also likely to view 4 of the big five animals (elephant, buffalo, leopard and lion). Return for breakfast and lunch at the lodge. In the afternoon, we will go for a boat safari on the Kazinga Channel to view hippos, elephants, crocodiles and other wildlife that can often be found on the banks of this channel. The Kazinga Channel is a wide, 32km (20 miles) long natural channel that links Lake Edward and Lake George. The channel is an oasis for many of the fascinating species that inhabit the park and has one of the world’s largest concentration of hippos. Kazinga Channel is well known for its abundant bird life, including colorful water birds and the majestic African fish eagles. Return to the lodge for an overnight stay and dinner. Meal plan: Breakfast-Lunch-Dinner. After breakfast we set off for Ishasha in the southern part of Queen Elizabeth for a game drive. You will also participate in a Lion Tracking project. 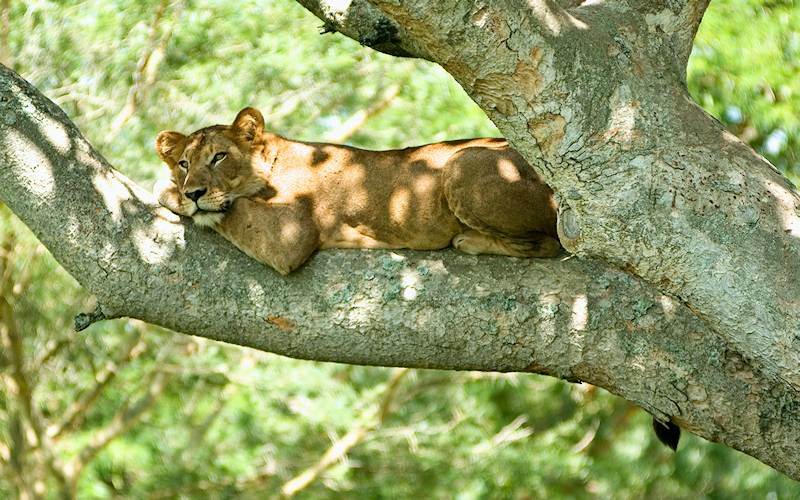 The area around Ishasha in Rukungiri District is famous for its tree-climbing lions, whose males sport black manes, a feature unique to the lions in this area. Ishasha, with its wide grassy plains framed by distant mountain ranges, provides an authentic safari experience. Enjoy watching a herd of elephants or topi, or a pair of hyenas with their typical funny behavior. After the game drive we will go further south, to Bwindi Impenetrable National Park. Overnight stay at Bakiga Lodge / Gorilla Forest Camp / Silverback Lodge. Meal plan: Breakfast-Lunch-Dinner. After a delicious breakfast we will hike to the park headquarters for a gorilla trekking briefing from the senior park ranger. You will be allocated a specific group of gorillas to track before hiking into the forest. The forest is one of the richest ecosystems in Africa. The park is a sanctuary for Colobus monkeys, chimpanzees and many birds (such as hornbills and turacos). It is perhaps most notable for the 340 gorillas, half the world’s population of the critically endangered mountain gorillas. Learn more about these gentle giants and observe them in their natural habitat. 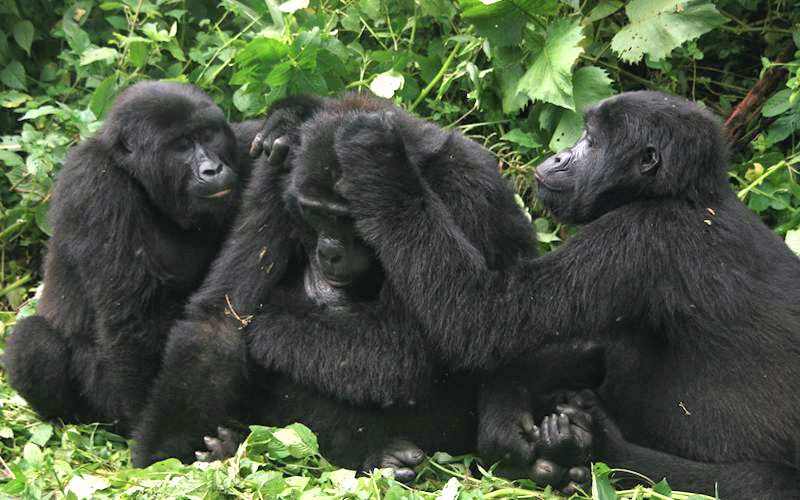 These gorillas are habituated and used to visitors. You will be allowed to stay 1 hour with the gorillas. The visitors provide vital funding for their conservation. Meeting the gorillas eye to eye in the wild is an intensive experience you will never forget. Return to the lodge for lunch and later on travel northeast to Lake Mburo National Park. Overnight stay at Mihingo Lodge/Mburo Safari Lodge/ Rwonyo Safari Lodge. Meal plan: Breakfast-Lunch-Dinner. After breakfast, take a game drive to see the park’s zebras and antelope species including the gazelle, the topi, sitatunga, bush bucks, water bucks and the largest of all, the eland. You may also see a leopard with some luck. As an alternative, you can go horse riding in Lake Mburo National Park. After taking your lunch, you will set off for Kampala and arrive in the evening to check in at Sheraton Hotel Kampala / Le Petit Village Hotel / Cassia lodge for an overnight stay and dinner. You may take a tour and have a scenic night view of Uganda’s capital also regarded as one of the safest cities in East and Central Africa. Meal plan: Breakfast-Lunch. Depart after breakfast for Jinja. Stop at Mabira for a forest walk where you have a chance to see a great number of colourful, exotic bird species, like the Great Blue Turaco, Nahan’s Francolin, Papyrus Gonolek, Cassin Hawk Eagle, the Forest Wood Hoope, the Purple throated Cuckoo, the Red Headed Blue Bill, the Black bellied Seed Cracker, the Shining Blue Kingfisher, the Blue headed Crested Monarc and the Black Hornbill. Mabira Forest Reserve is also home to many primate species, like the Uganda mangabey. Mabira is the largest block of moist semi-deciduous forest remaining in the central region of Uganda. It is a tropical paradise with more than 200 butterfly species that can be explored via an extensive trail network. Guided and unguided trails are available. There are 10 forest trails catering for people of all time schedules and abilities. We will enjoy lunch at the Rainforest Lodge, an ecolodge that was built using local and onsite materials to create a stunning atmosphere for visitors. We will proceed to Jinja town and to the source of the Nile. You will have an overnight stay at the Haven Eco Lodge, a peaceful and relaxed river lodge, rated as one of the best accommodations in Jinja region. Enjoy the tranquility and breathtaking view over the river Nile. Here you can just relax and gaze at the gently flowing water of the longest river in the world. Meal plan: Breakfast-Lunch-Dinner. After breakfast, in for one last thrilling adventure? Get wet and get wild, go for water rafting for a thrilling experience along the Nile, past the Itanda-Kalagala falls. This experience will arouse your adrenaline and will be one of the most unforgettable experiences to end your conservation safari in Uganda. Of course you can also decide to just relax and enjoy a quiet morning before returning to Entebbe through Kampala for your flight back home. Budget Accommodation: US$4,650 per person for 2 people, US$4,190 per person for 3 people, US$3,700 per person for 4 people. Mid-range Accommodation: US$5,995 per person for 2 people, US$5,600 per person for 3 people, US$4,940 per person for 4 people. Luxury Accommodation: US$6,225 per person for 2 people, US$5,900 per person for 3 people, US$5,240 per person for 4 people. Expenses of personal nature such as; drinks, tips, laundry, telephone, accommodation & meals not indicated in the itinerary and optional activities.